There are several Inventory reports available. 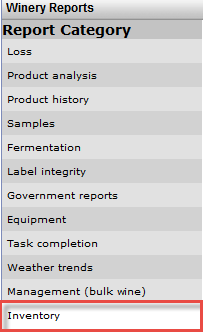 To access them, click the Reports icon at the bottom; from the Report Category list, select Inventory. The two reports most widely used are the Inventory stock report and the Packaged/Manufactured stock report; use the links shown to access these detailed articles. The other reports are covered below; use the link to jump to that section. Stock receipt report – As the name says, the report will show all inventory received during the time period you specify (defaults to the current month). The only filtering option is Owner; filtering by Winery is only available if you are running in multiple winery mode. Bulk stock receipt – reports all bulk intakes during the time period you specify (defaults to the current month). This report allows you to filter by Owner AND by the external PO (if entered at the time the bulk wine was received). Stock dispatch report – this report defaults to the current month, but, of course, you may edit. Note that the Include wine stock and Include bulk wine are checked on by default. You may restrict your results to one or the other by deselecting the appropriate box. You may also check the Show wine batch code (applicable to bulk only) if desired. This report is available in both pdf and csv formats; make your selection in the Format drop down box. Stock movement report – returns all inventory that moved from one location to another within the specified date range. Notice that there are some new filters available: Stock item, Code starts with, Storage area (specific locations within a single building), and Bin (sparkling products only). Inventory summary report – produces a summary report of the stock categories for the time period you select. Owner is a mandatory field so if you have multiple owners, you will need to run separate reports for each. You may choose All, None, or one or more stock categories. The following is a sample of all vintrace packaged goods in summary for the month of January 2019. Packaged/Manufactured stock report - This report differs from the Inventory stock report, which is primarily stock-item driven, where the Packaged/Manufactured stock report is operations based. This report is available in both PDF and CSV format. A particular Stock item may be reported upon, but it is the only item that will be covered.